Seventy years ago yesterday – July 2, 1937 – aviator Amelia Earhart and navigator Fred Noonan disappeared over the Pacific Ocean while attempting to make the first round-the-world flight along the equator. While I admire the world's aviation historians for keeping the mother of all hangar flying stories alive, I wonder why it really doesn't seem to surprise anyone but me that her legend continues to be celebrated despite the fact that she didn't complete her mission. What compounds my anguish is that I see major news outlets make plenty of hay about the 70th anniversary of the Earhart/Noonan disappearance, without every mentioning anything at all about the first woman to actually MAKE IT around the world. Jerrie deserves this notoriety far more then Earhart, for a number of reasons. Of course, the most obvious is that she MADE IT around the world before any other woman, a fact I cannot say to often. But Mock didn't fly the mission in a twin Lockheed Electra with a dude watching over her from the right seat. No, Jerrie, did it SOLO in a Cessna 180, a feat so difficult and dangerous, it seems unimaginable that it has been forgotten in aviation history. So what is it about the Earhart flight that makes it so special...portrayed in aviation history as being so much more important then Mock's flight? Some say it was the dates of the flights – 1937 vs. 1964 – that set the two apart. It has been written many times that Earhart's circumnavigation was far harder simply because she did not have “modern” avionics like Mock. All right, I will give them a point for trying, but Noonan wasn't there just for eye candy, he was the NAVIGATOR! And when you read Mock's wonderful book Three-Eight Charlie or interview her as I have, you'll see that despite having ADF and VOR on board, many of the stations Jerrie tried to use were very undependable. It's easy to believe that the "uptime" of a third-world country's VOR powered by lard stuck in the middle of the Sahara Desert back in '64 might have indeed been “spotty” at best. Maybe it was the fact that Earhart flew such a legendary ship, the Electra 10E, while Mock chugged around the planet in her faithful but basically stock hamburger chaser. Any pilot knows that when ice starts to form and thunderheads are building all around you, it is nice life insurance to have a Pratt & Whitney R-1340-49 radial hung on each side pumping out 600 horsepower each. That kind of power would have made Earhart's trip a lot less eventful, but Mock had to deal with the same kind of killer weather flying behind one Continental producing 225 horsepower. And when you're halfway between The Azores and Bermuda at midnight, it takes the courage of five hundred men to keep pushing forward behind that single engine when you see fresh rime forming on the struts. I could go on for hours about the massive differences between the two flights. 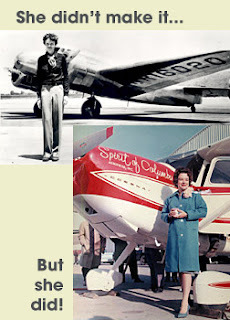 But one fact trumps all when it comes to comparing Amelia Earhart to Jerrie Mock: One woman actually made it back to the field she departed from. I mean no disrespect to Earhart and her legions of fans and followers, but I will not stop in this quest to fix aviation history until Mock is thought of in the same way we think about Lindbergh and, yes, even Amelia. There is a lot more information about Jerrie's trip here, and of course, her beautiful airplane, FAA N1538C, is now hanging in a place of honor at the Smithsonian's Steven Udvar-Hazy Center in Chantilly. VA., as well it should be. Sorry AE, but Jerrie Mock gets the nod for "All-time Legendary Female Pilot" honors. You know, when you think about it, someone really ought to make a movie about Jerrie Mock's life story.